I was reading Ashley's blog post (new to reading her blog) about Social Media Firsts and I wanted to link up, even though there isn't an official link up. I am have never embraced certain social media platforms (twitter), but I do like to think I am becoming better and better at using social media. So in honor of TBT, I will post my Social Media Firsts. Feel free to join in. It shows I joined FB on December 1, 2004, but I never posted anything until 2007. Myspace was all the craze and I couldn't be bothered with FB. Oh how times have changed. This was such a boring first post. Of course everyone hates Monday's (and not using proper grammar) and being at work. I guess I didn't want anyone knowing which person I was in this group photo. You can probably guess that I am front and center with the beer in hand. I at least put up a profile picture before my first status six months later (and maybe it was because an ex kept asking me to). I was a little late joining the Pinterest game, but don't worry, I now probably pin way too much. My Wedding board grew really fast and now my Future Baby board is growing just as fast. I still love this outfit. 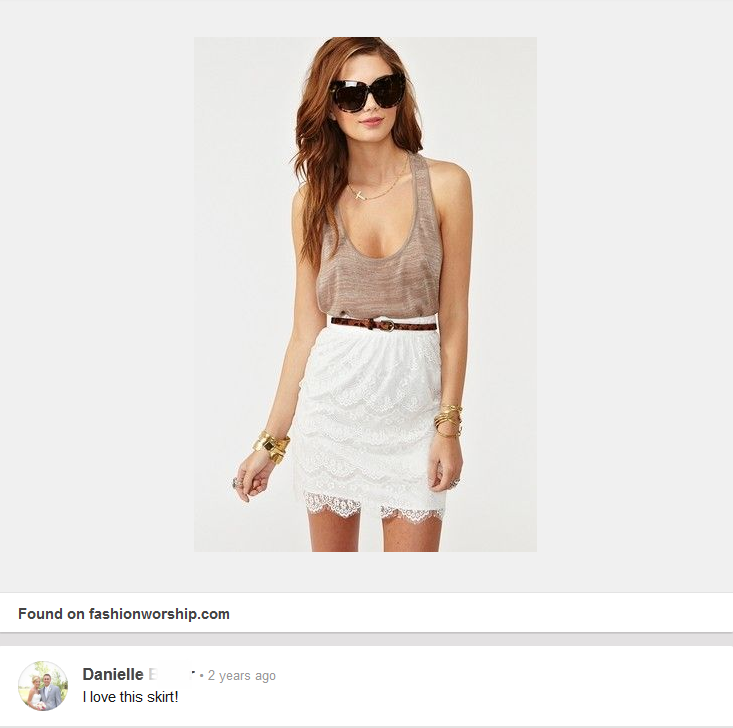 Oh I would kill for that skirt. I have never been into Twitter. I currently have 102 tweets over the course of two plus years. I sometimes look up news on there, but I should really start using it more. Now my husband, he has 9,778 tweets as of today, and I am sure that will grow by the end of the day. But back to my first tweet. 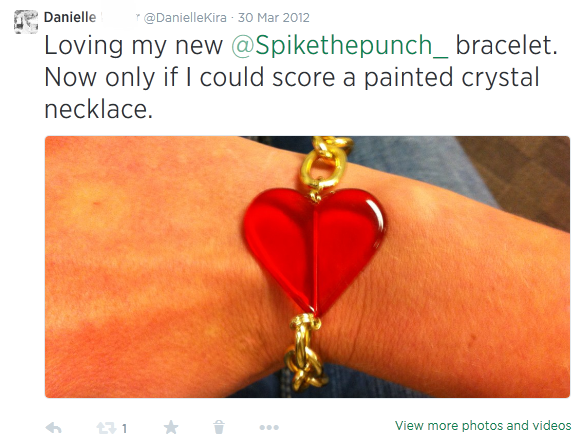 I loved Spike the Punch bracelets and necklaces. I still wear this beauty to this day. And by the way I did score several painted crystal necklaces. Too bad she isn't making them anymore. 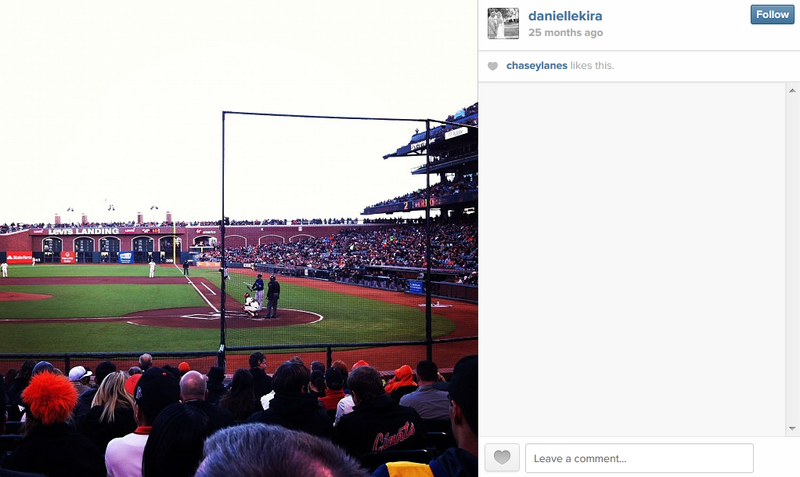 My first instagram post was from a beloved San Francisco Giants game. Check out my amazing seats. I only get to live this way during work trips on a Monday (seats were ONLY $100). I came into instagram late, but have fell in love with it way too much lately. I stop myself from posting so many of the photos I think would be a good share, but my husband just shakes his head at. Labeled as First Awkward Post. Of course it was awkward as I didn't know what I was doing, where this blog was headed and if I even wanted to blog. I started it out as a way to document things in my life for myself (kind of like a journal), but then started to post and post. Oh how I have learned so much about blogs since then. Your posts need pictures just because they do and it has to be something your readers want to read. This post....not so much. What I have gathered from this fun and embarrassing look back at my social media firsts is: I need to step up my game and tweet more, post more instagram photos even if my husband says not to and delete awful old profile pictures/status (not this one, but others people posted back then, ugh). Enjoyed my Social Media Firsts? Share yours with me. You are very welcome! I enjoyed this post and was a bit embarrassed by it too. The first profile pic...ugh.